Focusing on the family is an integral component of nursing practice. The guideline development panel acknowledges that most nurses already have relevant knowledge and skills to care for families. However, this guideline was developed to promote and facilitate continuing education, reflection and reaffirmation of the importance of caring for families. The intent of the guideline is to further build upon, improve and deepen nurses’ knowledge and skills towards meeting the needs of families. 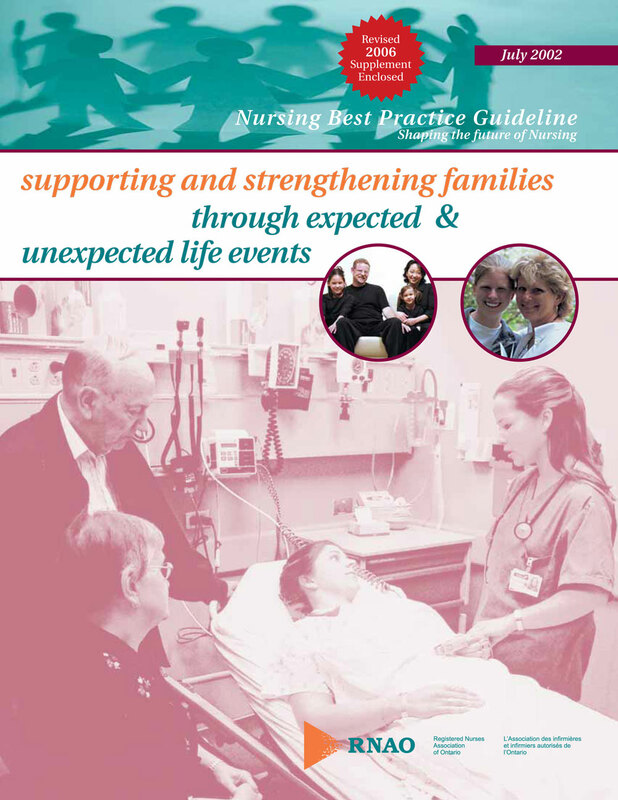 The overall goal of the guideline is to assist nurses in promoting family health through interventions and supports provided during expected as well as unexpected life events. Expected life events may include birth, school, adolescence, aging, and death, while unexpected life events may include trauma/accidents, chronic illness, developmental delay and disability. The guideline also includes recommendations for connecting nurses with families, in order to be able to assist families during these events. Lastly, this guideline includes recommendations for nurses and other health care providers to advocate for changes in the health care system. This guideline contains recommendations for Registered Nurses (RNs) and Registered Practical Nurses (RPNs). It is acknowledged that effective patient/client care depends on a coordinated interdisciplinary approach incorporating ongoing communication between health professionals and patients/clients, ever mindful of the personal preferences and unique needs of each individual patient/client.